Saint Joseph Benedict Cottolengo was born in 1786 at Bra in Piedmont, Italy. 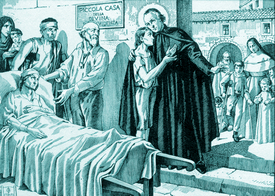 As a secular priest in Turin, he showed a special concern for the sick poor, receiving them into a small house. Confidence in God did not, however, cause him to cross his arms and observe. He slept only a few hours, often on a chair or bench, and then returned to his daily labor, work and prayer. “Jesus said to his disciples: “This is my commandment: love one another as I love you. I no longer call you slaves, because a slave does not know what his master is doing. I have called you friends, because I have told you everything I have heard from my Father. This I command you: love one another.”” – John 15:12-17. This man had a very dear wife by the name of Bona Dona, and he possessed a prosperous business. But neither the joys of his home life nor the success of his commerce had satisfied his ambition, since he felt destined for a brilliant public life, and desired to enter into the society of the rich. Saint Francis at that moment had a revelation from on High. By it he understood that Luchesio was to be the one who first of all would adopt the Rule of the third Order, which for some time he had been intending to initiate. He would go out with a little donkey to procure, or beg if necessary, what was needed for their convalescence. In this Bona Dona seconded him with all her strength. The only glory that Luchesio could not evade was that of having been the first member of the Third Order of Saint Francis which has saved so many souls: he stands at the head of the providential offshoot planted at Poggiabonsi. In the 13th century already, fourteen beatified or canonized tertiaries are counted. 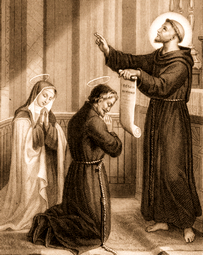 In 1694 the Friars Minor obtained from Pope Innocent XII permission to celebrate a feast day in honor of Blessed Luchesio, on the 28th of April. The apparition of Our Lady of Good Counsel is so celebrated, Her picture so well known and so honored in the Church, that it is very fitting to allot a place to this devotion. The little city of Gennazano, situated on the mountains of the former Sabina province, about ten leagues from Rome, for a thousand years already had honored the Blessed Virgin asOur Lady of Good Counsel. In the 15thcentury, the church of that city was dilapidated and about to collapse. A pious woman of advanced age named Petruccia desired to provide for its reconstruction, but the gift of her entire fortune, which she made for this purpose, proved insufficient. Petruccia foretold that the Blessed Virgin would Herself finish the work. Then on April 25, 1467, at the hour of Vespers, a celestial harmony was heard in the air, and the crowd saw a brilliant cloud coming down through the air, which came to rest over the altar in the Chapel of Saint Blaise in the Gennazano Church, where the restoration had begun. At the same time, all the church bells began to ring joyously. The cloud disappeared, and the marveling crowd saw a picture of Mary holding the Child Jesus, painted on a prepared surface, suspended in the air over the altar near the wall, without any natural support. It was duly verified that this picture had been miraculously transported from a church of Scutari, a city of Albania. Providence, wishing to preserve it from profanation by the Turks who were controlling that land, sent it as a reward for the faith of Petruccia and her fellow citizens of Gennazano. A history of the marvels of all kinds which have been wrought since that time near this miraculous picture, suspended in the air, would require volumes. Often the picture has been seen to change its expression, the eyes of the Blessed Virgin taking on an appearance of joy or sorrow. How many illnesses and infirmities have been cured! How many spiritual graces have been obtained! Gennazano in Italy is still a venerated pilgrimage site, much frequented by the people of that land, and many pious pilgrims from other nations, when time permits it for them, arrange to visit this blessed sanctuary. 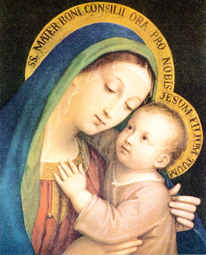 The Sovereign Pontiffs have granted many indulgences to devotion to Our Lady of Good Counsel, and the title Mother of Good Counsel was included in the Litany of the Blessed Virgin by Pope Leo XIII. “Jesus said to his disciples: “Peace I leave with you; my peace I give to you. If you loved me, you would rejoice that I am going to the Father; for the Father is greater than I.
I will no longer speak much with you, for the ruler of the world is coming. He has no power over me, but the world must know that I love the Father and that I do just as the Father has commanded me.”” – John 14:27-31a. “Jesus said to the eleven: “Go into the whole world and proclaim the Gospel to every creature. They will pick up serpents (with their hands), and if they drink any deadly thing, it will not harm them. But they went forth and preached everywhere, while the Lord worked with them and confirmed the word through accompanying signs.” – Mark 16:15-20.